We are frequently asked by our customers at what age a child can effectively use a defibrillator without supervision. After carrying out some research and interviewing a number of specialists, as well as reading relevant studies we created an easy to understand article which gives some reasonable recommendations. While children as young as 11 to 12 can use a modern defibrillator, a child is usually around 13 to 14 years old before they can provide efficient CPR (cardiopulmonary resuscitation). Read the full article. If you have any question about defibrillators or require replacement electrodes, just call 0800 612 6537 and our friendly staff will be happy to help. Although there are as many as 270 sudden cardiac arrests in British schools each year, there is no requirement for defibrillators to be kept on their premises. SADS (Sudden Arrhythmic Death Syndrome) UK is urging the Government to pass a law to ensure schools have these devices in place. 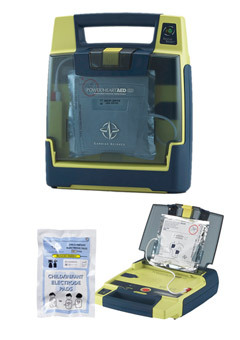 A defibrillator, also known as an AED (Automated External Defibrillator), delivers an electric shock to the heart when someone is having a cardiac arrest. Acting quickly is crucially important – every minute without CPR (cardiopulmonary resuscitation) or defibrillation reduces the chances of survival by 10%. SADS founder Anne Jolly said trials of the defibrillators in schools around the UK had proven to be a success. “We’re trying to stop young people’s deaths. We know, if a cardiac arrest happens, the faster a defibrillator is used on a person the better the chances are of them surviving,” she said. Safelincs supplies fully or semi-automatic external defibrillators with clear visual and audible step-by-step guidance to enable correct use of the equipment even under time pressure. Many of the defibrillators in the range come with a free place on a St John Ambulance defibrillator training course specific to the model. For example, each fully-automatic Powerheart AED G3 Plus defibrillator purchased comes with a free Responder Kit and a place at a training course. Also available are wall brackets and carry bags as well as additional / replacement products such as batteries and adult and child defibrillator pads. This year’s National Schools Fire Safety Week will run from March 19th to March 23rd. It is a week where schools can focus on the importance of fire safety with pupils. Many fires are started by children with them using matches, lighters and candles. Children are not always aware of how fast a fire can spread and that smoke can kill them just as much as the fire itself. We would like to help raise this awareness and are launching a competition for primary school children. Any child in England of primary school age can enter the competition by sending us their drawings highlighting fire dangers. This can be as a poster or just a picture showing a dangerous situation. We will then select a winner who will receive a home fire safety kit as well as a surprise present. Ensure you put your name, age and which school you go to on the back of the picture. The pictures should be no larger than A4.